ACT I: A Blasted Heath. That will be when Salmond’s gone. Hover through the plebs and filthy air. The Thane of Yes, Lord Naw-Naw, Doctor Spin. Casting their votes in this our referendum. Set in a silver sea from Sark to Shetland. Come, John Bull, and toll Big Ben. Crescendo in a thunderous night’s farrage. ST GEORGE: Blow, winds, and crack your cheeks! Rage! Blow! Ye exit polls and hurricanoes spout! Come, Boris, here’s the place. Stand still. ATTENDANT LORDS: Scotia and Boris, hail! Fanfare of hautboys, bagpipes, and a tucket. Stands all agog to hear Dame Scotia speak. Or to contain their escalating cost. Jowled lord of loss and light-touch regulation. United under your own Parliament! This blessed plot, this earth, and independence. Heading image: Macbeth by John Martin (1789–1854). Scottish National Gallery. Public domain via Wikimedia Commons. 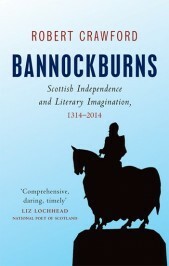 Robert Crawford’s Bannockburns: Scottish Independence and Literary Imagination, 1314-2014 was published by Edinburgh University Press in January. Testament, his new collection of poems (certainly not containing the above, but including poems on the theme of Scottish independence) is published in July by Jonathan Cape. He teaches in the School of English at the University of St Andrews.